If you’ve been reading ESI Money for any length of time you know that I love the Caribbean. We have been there a handful times (three on cruises and twice on trips to Grand Cayman). If it was up to me, we will go there at least once per year for the rest of our lives. In addition to my love of the Caribbean, you also know that I’m fascinated by the thought of retiring on a cruise ship. It’s still something I would like to give a try. But that’s a no-go from my wife. But what about going a bit smaller? What about buying a boat, living on it, and sailing it around the Caribbean? Is that reasonable? And what would it cost? It’s something I’ve pondered for some time now, but has recently popped into the forefront of my thinking. This “dream” (if you can call it that) started many years ago. We took a cruise to escape the Michigan winter. We booked a cruise to the Caribbean to escape the cold. On the cruise we took several excursions (one at each port). Of these excursions, we loved catamarans the most (my daughter and I would get on the front, feet hanging over the edge, and water splashing in our faces as we sailed.) Haha to the suckers in Michigan!!! Once back home I considered going back to the Caribbean but this time renting a catamaran (with a captain). My wife didn’t like the idea so we put it on the back burner and took another cruise the next year. The idea of living/sailing on a ship had almost perished from my thoughts when my interest was suddenly renewed. My friend, Michelle, from Making Sense of Cents gave up her RV living for what????? Yes, a catamaran! I mean a very nice boat. In the Caribbean. I guess I always knew that some people did this, but I was clueless that many did. And now someone I knew was doing it! Obviously I was intrigued and asked if she was going to document her experiences on video. But since she already makes $19,927,345 a minute on her blog (or something close to that), she doesn’t really have any incentive to do it. But she did share links to several people who are recording their lives living on catamarans. So for the past few months I have been watching YouTube videos on the subject. The first is a video blog titled Sailing La Vagabonde. Anyway, this series is done by an Australian couple (+1 for the accents) who produce videos of their catamaran life. The videos are very professional (+2) and always include cool music (+3). And the combination of an attractive and charming woman (+4) with a stud of a captain (+5, you should see the videos of him deep diving and spear fishing, the guy is a beast!) makes their videos fun, entertaining, and educational while also showing great Caribbean scenery. The next video blog is titled Gone with the Wynns. Haha! Big bonus points upfront for a cute title! This 30-ish couple is sailing all over creation and sharing their story. They are very friendly people, the sort you’d want to have as neighbors — especially since that would mean you’re in a great location as well! They also have cats on board, which makes for some funny video moments. I watched them cross the Pacific Ocean in their catamaran (yes, you read that right — they did it) and I was on the edge of my seat with every video! Can you imagine crossing the PACIFIC OCEAN in a catamaran????!!!! I was afraid they were going to be hit by a 50-foot wave, lose power, run out of food, or any one of a number of calamities that seemed imminent. I tell you, I think I was more happy for them to see land than they were. I’m not sure what’s going on with the gang from SV Delos. There are several guys and girls, somewhat of a rotating cast (or so it seems), in their 20’s, sailing all over creation together. Imagine a college fraternity and sorority got together and decided to sail. That’s a bit of what SV Delos seems to be about. I have no idea what their off-camera antics entail, but I bet it’s crazy. The on-camera stuff is mild and full of great scenery, exotic locations, and lots of sun and water. Now that Michelle’s got me watching all these sailing video blogs, I started to wonder about the finances. What does it cost to live on a boat and sail it around? What does it cost to live on land? As you know, there are a gazillion answers to that question based on lifestyle choices and a ton of other factors. It’s the same with living on a boat. For instance: Do you want to live on a multi-million dollar yacht or a dinghy that’s the water version of camping in a tent? Your choices make a HUGE difference. But I still wanted to get a “general” sense of what it would cost, so I did some googling. Let me share some of the resources I found that detail these costs (at least in part) and make some comments along the way. Yeah, I’d say they earn money alright. They currently have over 600k YouTube subscribers. In other words, they are not hurting for funds. Next I found an article on Business Insider. In an average month, it costs them around $2,200 to live on the boat. By comparison, they would spend $2,500 to $3,000 to rent an apartment in a similar area of San Diego, and still be paying the boat’s mortgage on top of that. Ok, so that’s if you want to live on the boat and not sail it. A bit different than what I was looking for but still adds to the general topic knowledge. They go through a variety of expenses (note to the editor: a chart would have been nice to summarize everything). Budget $52K USD per year to live full-time, well done if you spend less. There are different budgets and different styles of cruising – you can spend from $500 to $2,000+ dollars per month while sailing. We give you the tools to calculate your own cruising budget, because you need to find a budget that works for YOU. Their actual costs: between 500 and 700 Euros a month ($560 to $790 US dollars). They also give this advice: to lower expenses, be as self-sufficient as possible. In other words, you can save a ton by anchoring in a harbor versus at a marina, creating/using your own energy, catching your food, etc. Now let’s go into the lightning round. Lots of information here and quite a spread on costs. So What Does It Cost to Live on a Catamaran? I am surprised by the costs. Both the initial boat expense plus living costs are waaaaay lower than what I thought they would be. I’m not sure what I was expecting but my image was that it was an expensive lifestyle. And yet the reality appears to be quite affordable. Once you think of it, the costs being low are not really that surprising. These people are living in the equivalent of a 200 square foot tiny house. Those aren’t that expensive on land either. Given this, I wonder if “retiring to a catamaran” is an affordable option for those struggling for retirement funds. Maybe it’s better (as cost effective or even less expensive) than moving to a low cost of living city or foreign country. In the end I think this is an exercise in futility for me. While I might consider this as a lifestyle option, my wife still has flashbacks of the cruise where we had 25 to 30 foot waves. She gets seasick just thinking about that. So I’m not likely to be sailing around the Caribbean anytime soon. But…I still have hope that we could rent one for a week and see how we like it. Ha! Anyone out there have a boat and/or ever want to sail/live on one? I’m hoping you can share your stories and tips with the rest of us. Need to check out bumfuzzle. Start see the beginning, you’ll be hooked for weeks. Retiring on a boat is definitely doable. I know your wife won’t go for it, but hopefully you get more cruises in your future. One boat-living idea that I find interesting is doing the Great Loop. No, it’s not really sailing (although some “loopers” are, in fact, sail boats). And it’s not focused on the Caribbean (although the Great Loop can include a stint through it). What it is, is a loop that includes a trip down the Mississippi River, the Florida Intercoastal waterway, Everglades, and possibly the Keys, East Coast shore hopping up to the St. Lawrence Seaway, all the way back to where you started (hence Great Loop). Fun post! Some of these numbers are a little off- La Vaga is actually a $1,000,000 catamaran. Their monohull is what is quoted in that piece you mentioned above – not their latest boat. Also, a lot of people don’t talk about the actual refit costs, and that’s where a lot of the boating costs add up quickly. I haven’t met any full-time boater who says that boating is affordable. BOAT stands for Bust Out Another Thousand 🙂 I’ve met several people in the last year who have quit sailing because of the costs, and have moved back to a land base. Boating can be done for cheaper, but I find that’s not the average boater. The person commenting above is the first I’ve heard say that it’s way cheaper, haha. But, he’s a liveaboard in NZ so that is different. 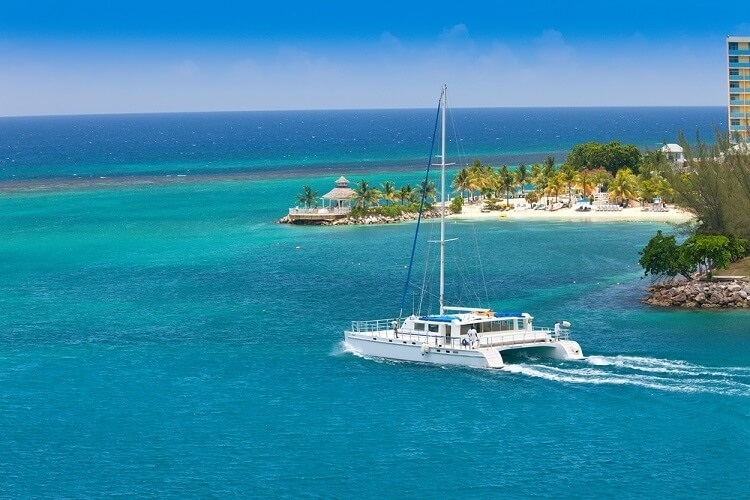 My co-workers (married) retired and purchased a $1.4M catamaran about 10 years ago with the intention of it being their forever home, as they were both avid sailors. Lived in Panama for a few months to really learn the boat and then sailed to San Diego with a couple friends. Stayed a few months before sailing back to Panama, selling the catamaran, and moving back to the Bay Area. Too much isolation away from family, and too much stress to have someone awake at all times on overnight sails and too much stress with the constant repairs. Definitely not a life that I would choose. Gosh if you were to decide to do this, (and I understand your spoise’s concern) it would be fascinating to read your blog entries on how you go through the entire process of researching boat; buying boat and tailoring it to your style. So we compromised this year! We just returned from a full month in the Florida Keys where we rented a nice house (AirB&B) and a boat for the month of March. We loved it so much, that we are already planning two months there next winter. Never saw myself as a snowbird type, but hey…it was pretty dang awesome! We plan to throw in a couple of cruises to the Carribean, and we are planning a road trip to Acadia, Maine and Nova Scotia, CA this summer. IMO, why be locked in to one option, when you can have it all? Love Gone with the Wynns! I believe they are currently in the South Pacific. Last year I traveled to American Samoa. The Wynns haven’t been there yet, but I’m hoping they visit. Watching their videos reminds me of being there…especially the color of the water. And the whales. Yacht vacation to a great thing. I love to spend time alone by the water and I often use this type of vacation. I live in Poland and I have my yacht here. Sasanka 700 😀 maybe not to big but very nice for alone weekend or small trip with friends. My dream is to go to the Caribbean or Greece for a yacht trip with friends.